What do healthy soil and hedgerows have to do with climate change? Perhaps much more than you’d suspect. While healthy soil retains water and enhances the flavor and nutrition content of food, it also critically increases a farm’s ability to draw down carbon dioxide and thus mitigate global warming. On our HomeFarm, we work to maximize soil health by planting no-till cover crops, making our own compost to add fertility, and integrating perennial crops and trees. This fall, we are enhancing our hedgerows as another way to reduce our carbon foodprint. “Hedgerow” is an old English term that refers to mixed plantings of trees, shrubs, grasses, perennials, and ground covers that grow along field borders, fence lines, and waterways. In times past, hedgerows were considered essential for marking ownership boundaries, and for keeping livestock in or out of the fields. 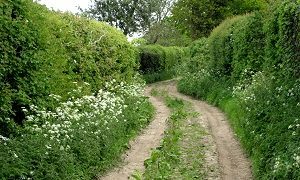 Those particular reasons for planting hedgerows aren’t as relevant now, but they can provide many benefits which are vital for the future health of our planet. They create diverse root systems that help stabilize soil, reducing or preventing soil erosion caused by rainwater run-off. They filter out pollutants such as pesticides and slow down sediments and organic material that can flow from agricultural fields into rivers and streams. They slow down the rate that excess rain water enters streams and rivers, helping to reduce the risk of flooding. They form windbreaks, creating zones where plants do not transpire as quickly, which means less watering is needed. They store relatively large amounts of carbon in their biomass, offsetting emissions from other sources, thereby helping to reduce the rate of climate change. Among their other bonuses, hedgerows are demonstrably useful in sequestering carbon. Here’s how it works: when plants take in carbon dioxide from the atmosphere through the process of photosynthesis, the carbon dioxide is broken down, allowing the carbon to become part of the plant’s tissue. As plants die or shed tissue, either through natural processes or pruning, the carbon that was stored in the plants breaks down and enters the soil. According to studies, the carbon sequestration potential of hedgerows shows that soil has the potential to sequester three times the volume of carbon as compared to plant tissue, and twice the volume of carbon as can be sequestered in the atmosphere. With all this in mind, planting hedgerows is a good way to add to the organic composition of our soils and increase water conservation, and most importantly, to contribute to the carbon offset of our modern, carbon-heavy lifestyles. For more on how to plan, prepare, and plant hedgerows, we recommend Hedgerows for California Agriculture: A Resource Guide produced by the Community Alliance with Family Farmers (CAFF). This entry was posted in Grow Your Own. I saw your nice article on hedgerows, and your reference to the 2004 CAFF Hedgerow Manual. I wanted to let you know that CAFF just published a colorful 2018 update, entitled Hedgerows and Farmscaping for California Agriculture. It is easily accessible on the CAFF website (https://www.caff.org/resources/on-farm-sustainability/ ), and is also on my website (www.HedgerowsUnlimited.com). If you email me, I can also send you a PDF.